Smart Service is the best locksmith dispatching software solution around. Our QuickBooks integrated software boosts your day-to-day operations, no matter the size of your business! All you need is to assign a job to any available employee and the client’s address, job specifications, and additional notes with be linked to our mobile app. The ease and organization Smart Service provides will be noticeable not only to you, but to your customers too. You’ve already spent time and effort updating your data in QuickBooks, so our locksmith dispatch software ensures you don’t have to start from square one again. Our software integrates with QuickBooks so that any information you’ve added to a customer’s profile (address, directions, job history, notes) gets sent to the technician assigned to that customer. Scheduling new jobs as they turn up has never been easier. 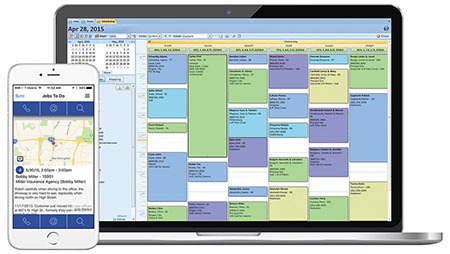 The Smart Service dispatch software interface lets you pull up a daily calendar of active technicians and their current jobs and openings. You can schedule a new job in seconds, even while on the phone with a new customer. No need to put anyone on hold while you try to call everyone and check in. You can see how many jobs a person has and who is the closest to the new job, ensuring dispatching runs as smoothly as possible. Better still, their work will automatically sync to all company devices, allowing other dispatchers to avoid overlaps or double bookings. The available technician will then receive their new job on their mobile device via the Smart Service app. After you’ve scheduled a new job, all the information in your system is linked to our Smart Service mobile app. When your technician refreshes syncs their device, they will get all the updated jobs, information, and changes to their routes. In addition to helping them find the fastest routes to their jobs, the GPS feature on the app lets dispatchers know how close someone is to a potential or new job. Technicians in the field can also update work order information, close out invoices, and even create estimates for the office to approve. The Smart Service mobile app helps your locksmith company streamline all aspects of the job, all from a mobile device.